Enterprise is an extended family of 64,500; a world-class company with homegrown roots. Through tremendous leadership and the entrepreneurial spirit of our employees, we've built the largest rental car company in North America - customer by customer, car by car from the ground up. But our goal has never been to be the biggest; we simply work hard to be the best. The secret to our success steams from our companies humble beginnings. Our first customers paved the way for our business model of today by stating that they wanted to rent cars where they lived and worked. That idea grew into a successful network of rental car locations all around the nation. Our convenient offices make it easier for locals to not only rent our vehicles, it also makes it easier for us to provide our free pick and drop-off services. Our main goal is to create great relationships within the communites where we have locations. Transporation is a huge part of everyday life. SO when you need a vehicle, visit your local Enterpise Rent A Car and drive away with the car of your choice! 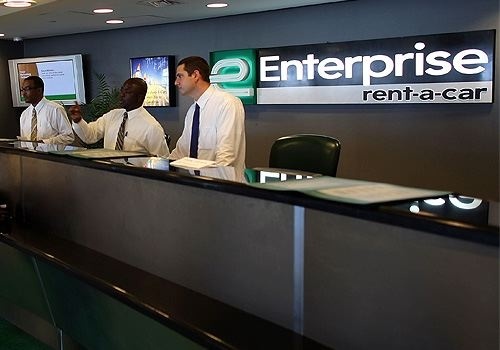 Enterprise Rent A Car has over 35 convenient locations around the city of Las Vegas, with our main Las Vegas facility located at McCarren Airport. If you're ready to book your car rental, you can use our online car rental service and arrange for some to pick you up! When you're ready to book your car rental, you can choose from our healty line up of vehicles. All you have to do is choose the rental car that's right for your situation, book it, and drive away! It's as simple as that. ADDRESS 9484 W. Lake Meade Blvd.